With 73 per cent of ballots counted, the incumbent head of state admits defeat and congratulates the challengers who are now on a runoff scheduled for 21 April. The official transfer of power is set for 19 May. No one won more than 50 per cent in the first ballot. East Timorese are happy to see that the finalists are two veterans of the independence struggle. 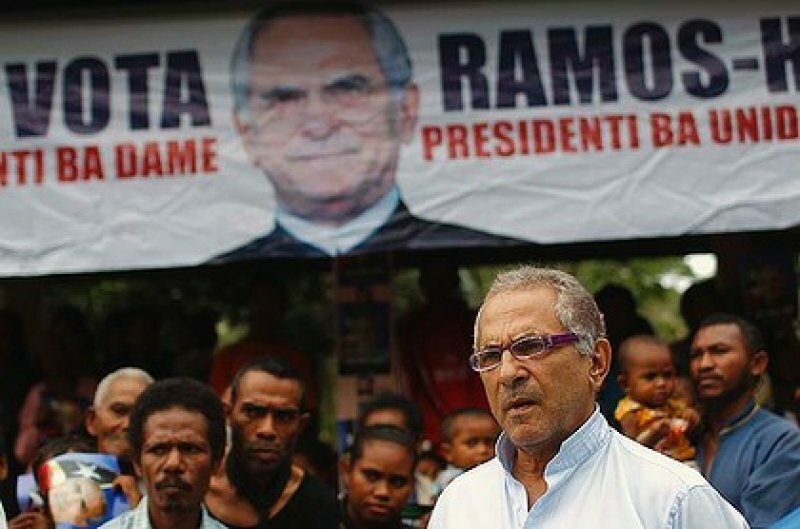 Dili (AsiaNews/Agencies) - Incumbent President José Ramos-Horta admitted defeat and congratulated the two challengers who will take part in the runoff election on 21 April to choose East Timor's next head of state. Saturday's vote went off almost without a glitch or accusation of electoral fraud. Twelve candidates ran for the top post, which is largely ceremonial as the president is the guarantor of national unity. Now Fretilin's Francisco 'Lu Olo' Guterres and former military chief Taur Matan Ruak now will vie for the highest office. The official transfer of power is set for 19 May. With about 73 per cent of the total votes cast counted, none of the 12 candidates who contested Saturday's election were able to garner more than 50 per cent of the vote. Guterres led the pack with 28 per cent, followed by Ruak at 25 per cent. Ramos-Horta was third with 18 per cent. "I congratulate the two candidates who continue into the second round," said the 1996 Nobel Peace prizewinner Ramos-Horta, "and also to the people who supported me throughout my mandate." Although still counting the ballots, the National Election Commission confirmed that the poll went off smoothly despite some last minute problems. "Some polling stations ran out of ballot papers, for instance in Dili and some other places, but all have been resolved," Commission president Faustino Cardoso Gomes said. Many voters seemed pleased that the two finalists were veterans of the independence struggle, local sources said. More than 1,200 United Nations troops provided security in East Timor's second presidential elections as an independent country. The first poll in 2007 was marred by violence that left 37 people dead, raising real fears of a civil war. Among the country's many challenges, dependence on underground energy sources tops the list. In fact, oil and gas constitute up to 90 per cent of state industries. For the International Monetary Fund (IMF), the country is the most oil-dependent economy in the world. About 95 per cent of East Timorese are Catholic, but there are also small communities of Muslims and Protestants. In the past, the nation experienced long periods of critical food shortages despite help provided by the international community.